Many brides dream of a tropical wedding; white sand, blue skies, clear seas. The perfect day in the perfect location. But where to find this notion of paradise? With a spiritual population and beautiful surrounds, Bali is a top choice amongst our readers. And with Asia Villas, not only will you get your dream beach location, but also your dream accommodation. A stone’s throw from Denpasar, your guests can jump off the plane and be immediately transported into the island luxury that is Bali. 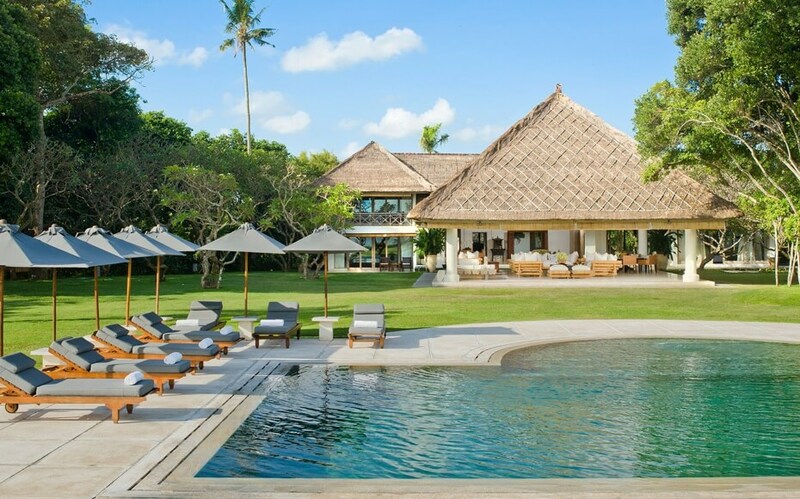 Asia Villa’s lodging at the Chalina Estate is an idyllic retreat on a rural stretch of coastline just north of some of Bali’s most popular surf spots. Catering for up to 26 guests, the villa feels spacious yet homely offering areas to relax, to dine, to lounge or to soak up the sun in this unique environment. Surrounded by rice terraces and nearby mountains, you are assured of a stunning backdrop to your day’s events with views unrivaled by any other location in the world. If your guests decide they want to explore, Seminyak is only a short drive away and offers a selection of restaurants and shops. 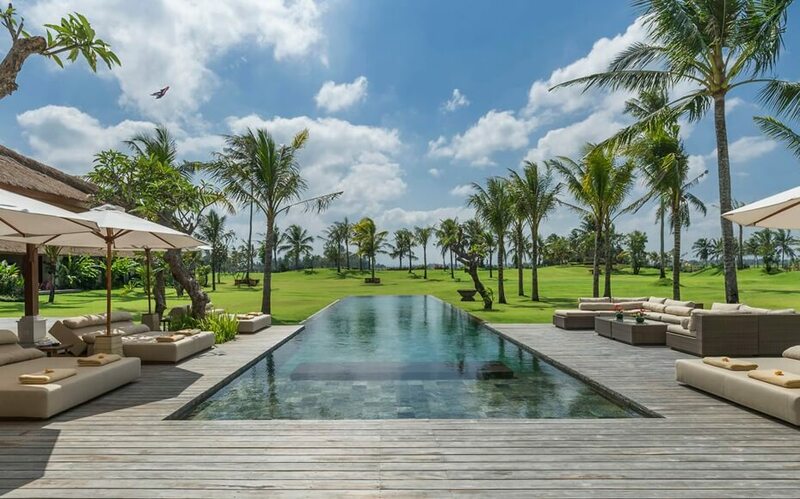 Just beyond you’ll find Nirwana Bali golf course, should anyone want to swing a club. All-in-all, there is plenty on offer to entertain both during the ceremony and beyond. With a sea view and a beachfront location, you couldn’t ask for a better destination when planning a wedding. The dedicated staff of 5 leave you assured that your guests will receive the 5-star treatment they deserve from the second they arrive. On-site chefs can create any dish you request and are flexible to any of your desires making planning the wedding breakfast a joyous affair. Locally translated as ‘villa on top of the waves’, you get a sense as to why this is one of Asia Villa’s prime wedding destinations. It has all the intimacy a bride could hope for when planning a wedding, with all the surrounds one could dream of in a tropical paradise. Looking across mature gardens and fronted by a beautiful stretch of beach, the privacy of this villa is unrivalled and could be the perfect choice for those looking at a smaller-scale wedding. The exceptionally beautiful estate at Kaba Kaba provides the perfect romantic backdrop for any ceremony. This 8-bedroom villa can accommodate up to 16 guests in superior comfort in some of the most beautiful surrounds one can find. Looking out onto one of the most famous Balinese views – row-upon-row of rice terraces being worked by the local village communities – there are few other options that share such an intimate connection with the island’s heritage. The estate stretches in every direction so there is great space to explore should you feel the need to unwind with privacy, or bring your sportswear and choose to play on the property’s tennis court and croquet lawn. The property was designed with entertaining in mind and the expertly-trained staff are at your disposal ensuring a seamless ceremony with every detail catered for. A great choice for families and couples alike and a truly unique spot in Bali. Perched some 100 meters up atop a clifftop overlooking Uluwatu, is there any more beautiful a view in the world than that offered by The Istana. Described as a ‘palace in the sky’, it’s no surprise that couples who see this property immediately want to host their ceremony there. The Istana attracts the jet-set of the world, such is the majesty of the place, and if ever there was a reason to indulge then your wedding could be it. As your guests pull into this magnificent destination, there is no way they can fail to be impressed by its position, the set up and the surrounds. Truly unique in its composition, it is an architectural achievement as much as a natural phenomenon.Enjoying a breakfast whilst overlooking the surf breaks or simply relaxing with a book, there is no better place to ease pre-wedding nerves than up above what is arguably the most famous wave in the world. 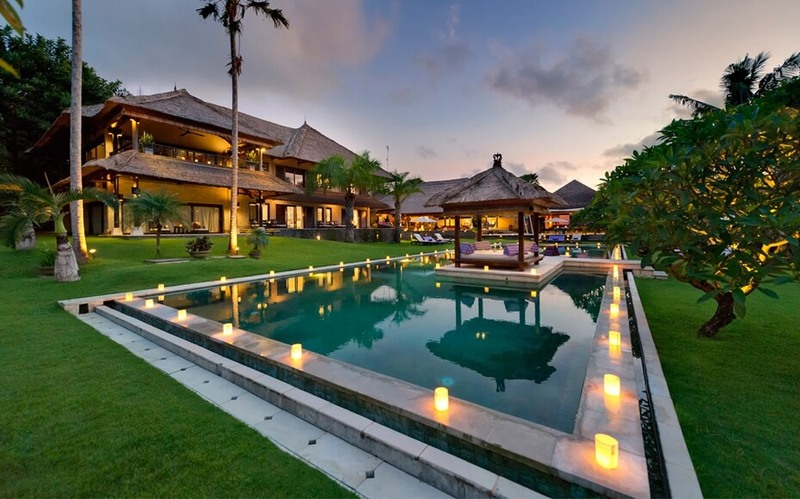 You can guarantee your guests will arrive with jaws dropped when they see Bayu Gita, such is the majesty of the setting. 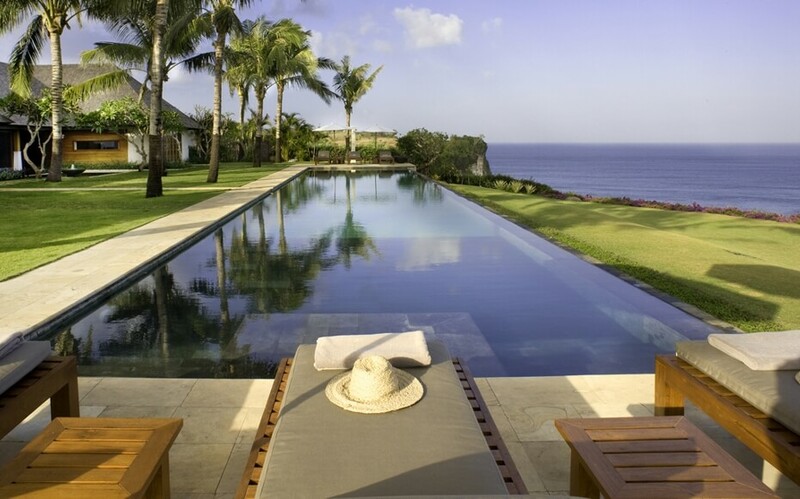 Sitting on the east coast of the island, the villa offers a distinctly different feel to that of the others on our list and it stands alone in its beauty. 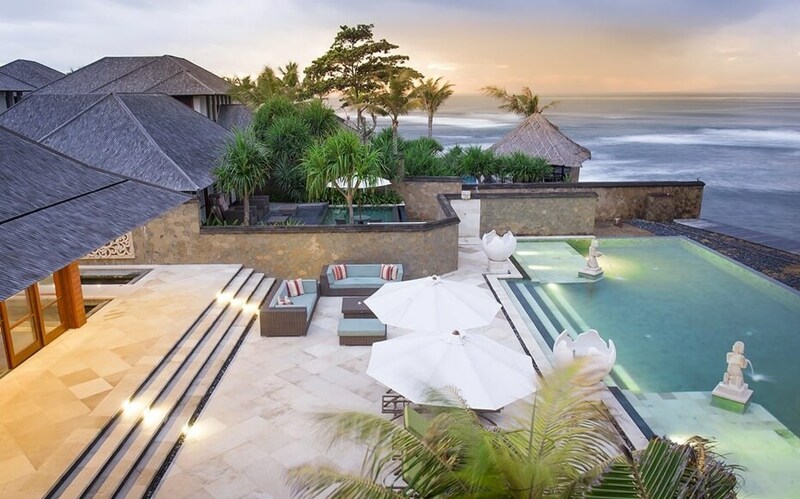 Looking out across the black sands of Pabean Beach and over the Badung Straits, you are whisked away into a dreamland the moment you step into this beachfront accommodation. Not only do you have the uniquely colored beach expanse, you are neighbored by one of the most charming fishing villages in the region with its sleepy feel and welcoming vibe. If you are looking for something different, for a wedding that stands apart, then Bayu Gita is the venue. Dramatic views and a sense of space provide this beautiful atmosphere for hosting and the staff are on hand to ensure that there is nothing for you to think about apart from your vows. There is no better place to host your wedding than at one of Asia Villa’s beautiful accommodations in Bali. Not only are the locations unique, you have the luxury of knowing that staff are on hand to make sure none of your guests’ needs are left wanting and there are no hidden surprises. Everything will be catered for to the highest standard meaning the perfect, stress-free day you always wished for. Organizing a wedding abroad can be an intimidating task but choosing the right location with a supportive team can make the whole process seamless.